Kitty goes ga-ga for Gacha! I think Gachas are now much more common and cost a few quid, if not more, but you can get some pretty awesome prizes from them . Looking back though I was quite happy with my Bazooka Joe gum. They were brilliant actually; with their little comics inside the wrapper. I never did save them up and send off for a prize though; I kinda wish that I had now. Now, I was going to say that you can enjoy Gacha in Second Life without the expense, but that’s a big fib, because the Gacha festival is upon us from March 1st (TOMORROW!!) and it’s going to cost you some serious lindens, purely because of the amount of amazing items that you can win. I’ve had a sneaky-peaky at the preview page and it’s left me giddy with excitement to the point of feeling like a kid waiting for Christmas day. Seriously! I’ve been looking forward to this event all week, and now that it’s almost here I don’t know how I will sleep tonight knowing the amazing stuff that awaits. And trust me when I say there are some truly amazing items to play for as well. From collectibles to clothing, to furniture, glasses, musical instruments, skins, poses, headgear, jewellery,avatars and even gypsy caravans! There’s something for everyone at this event. It is going to be IMMENSE. I’m both pleased and pissed that there’s a tumblr where you can view the items. Pleased because it gives me a chance to work out what machines I’ll be hitting up tomorrow, and pissed because it just reaffirms the fact that I have about 24 hours to wait until the event starts. I can’t wait that long; the tension is killing me! So while I wait I’ll share with you some of the vendors that I’ll be visiting. Alas, I can’t visit every single one without taking out a pigging virtual loan or selling a body-part. These are Gacha after all and there’s no guarantee what you’ll get, but some of the prizes are outstanding. I’m all about collectibles, as my post earlier this week may have proved, so with that in mind I’ll definitely be visiting the NARDCOTIX ‘Puss Pillow’s vendor. I mean, this ticks ALL my boxes. Cats + Pillows= one happy kitty, and JUST LOOK AT THEM! They’re so bloody GORGEOUS! I’ll be having ALL of those thank you very much. L$50 a play, with a choice of 12 pillows to win. It’s hard to pick a favourite from the picture but I will really be hoping to get either of the two rarest in that machine. 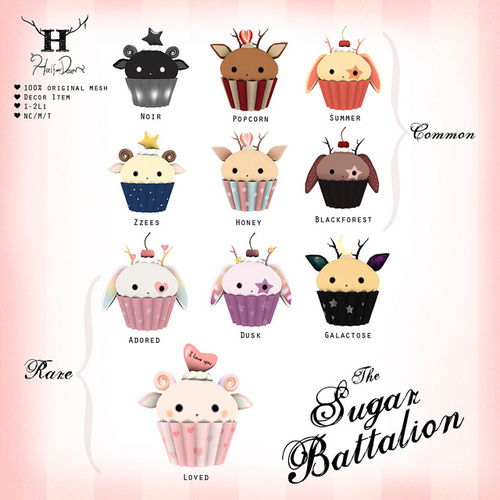 HALF-DEER have provided a range of cup-cakes that I’ll be hitting up with gusto. I blooming LOVE cupcakes, and these look scrumptious, and are just too cute to not have in your virtual abode; there are ten to win at L$25 a shot. Again, I don’t mind which one I win from the selection either, so long as I end up with a full set! They will look darn tasty in my kitchen won’t they? 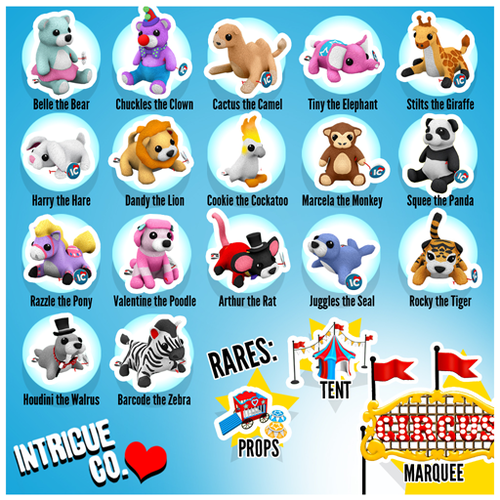 Time for a rousing chorus of “It’s so FLUFFYYY!” because INTRIGUE CO. have designed a new selection of Plushie Pals for the event. They’re circus themed and look flipping brilliant! The rares in this machine are actually props, a tent and a marquee so that you can play Circus in Second Life. Again, they’re all stunning so no, I can’t pick just one because I’ll be happy with any of them. But then again, the Zebra is calling my name..! Every girl needs a teddy bear, and the Candy Bears from SWAY’S are just perfect companions for cuddling. 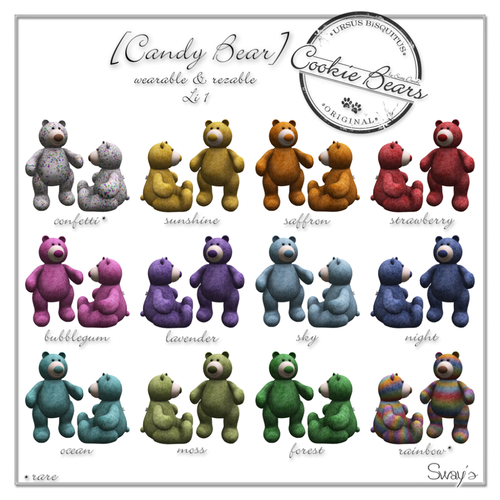 There are 24 to play for, with the ‘Rainbow’ and Confetti’ bears being the rares in this selection. At L$25 a play they’re not going to break the Linden bank too much either! My final collectible choice are the ‘Bento Friends’ Bento boxes from STANDBY. 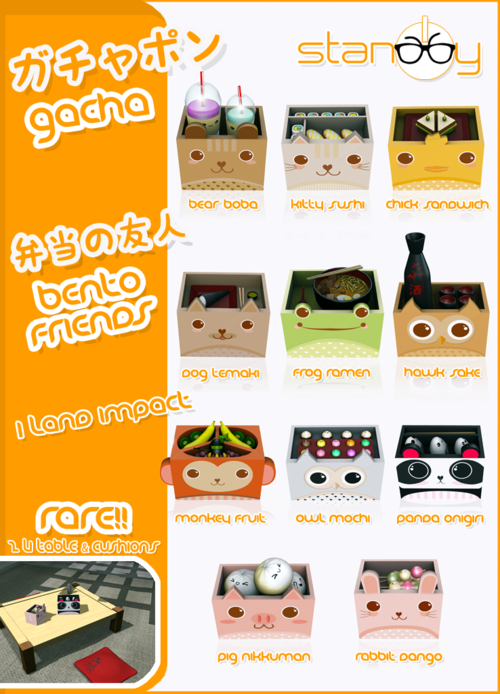 These are super cute with 11 animal themed mesh bento boxes to be won, and a rare item comprising of a table and cushions for you to use while enjoying your bento feast. NOM! That’s my pick of the collectibles, so what about wearables? 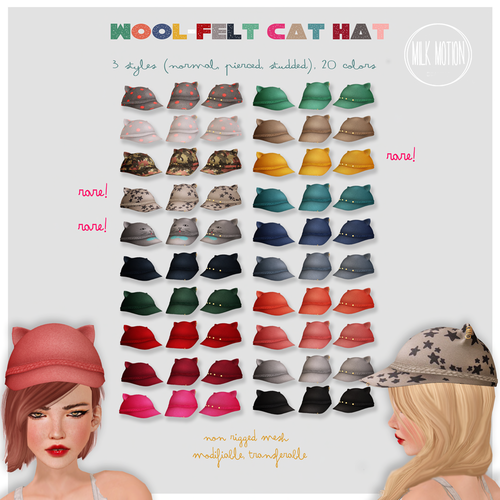 Well, I’ll definitely be having a shot at winning some of the rare Wool Felt Cat Hats from MILK MOTION. There are *gulp* 60 to win, but I have my eye on the starry cap; it looks rather swish, don’t you think? I’m pretty sure this is going to be a hugely popular gacha item, and is just L$50 a go. TABLEAU VIVANT have two fantastic Gachas this round. First up are some back-packs. 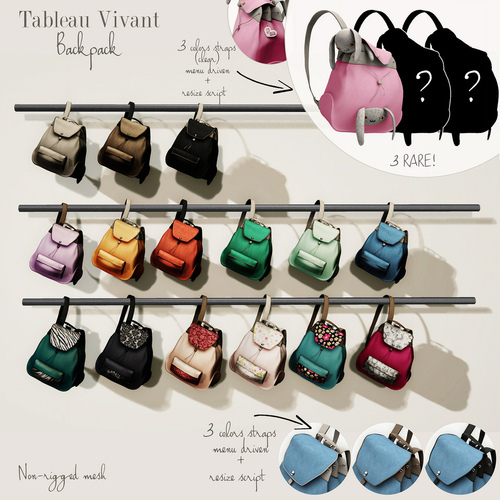 I don’t often wear bags in Second Life, but these would change my mind. 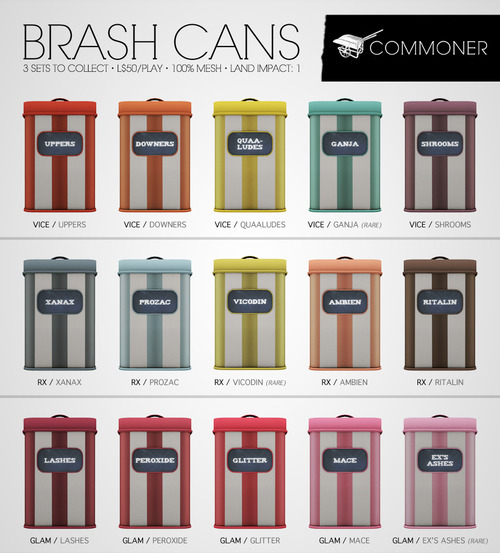 They look great, are non-rigged mesh and feature resize scripts too for a perfect fit. Not only that but I’m intrigued by the three rare items in this Gacha, because two of them are surprises. We can see that one of them is a bunny back-pack which looks unbelievably squeesome, but the other two are shaded out so you can’t see what they are. It’ll cost you L$75 each time you try to find out. Worth a shot? It’s one of the more pricey Gacha items, but in my opinion more than worth it. And so is the Spirit Hood available from TABLEAU VIVANT’s second gacha in the event; this features a virtual version of those animal hoods with mittens built in that everyone was wearing around Christmas (yes, I’ve got one in real life, shush) Judging by the picture this looks to be quite a promising item, BUT it’s one-size rigged mesh so I recommend that you try a demo before parting with your L$75. If the demo fits, then there are 27 to win. Fingers crossed the demo fits me then! NYLON OUTFITTERS have an ‘Art Nails’ mesh nails Gacha at the event and you can win one of ten sets of nails. It doesn’t say on the poster if any of them are rarer than others, but I certainly have my eyes fixed on the ‘9 Lives’ and ‘Party animal’ set. At L$50 a try I’ll be keeping my fingers crossed for some luck on this one; they’re rather fancy aren’t they? I love the quirky presentation and styling of these so much! I’ll also be hoping for good things at THE SECRET STORE where you can win a pair of vintage roller-skates. 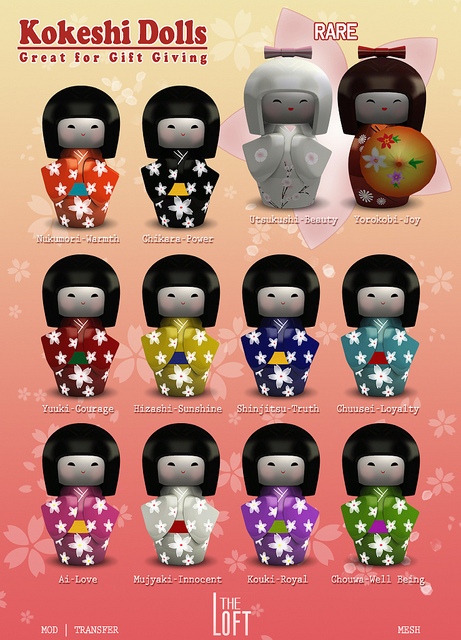 There are twenty different styles, with three rares. 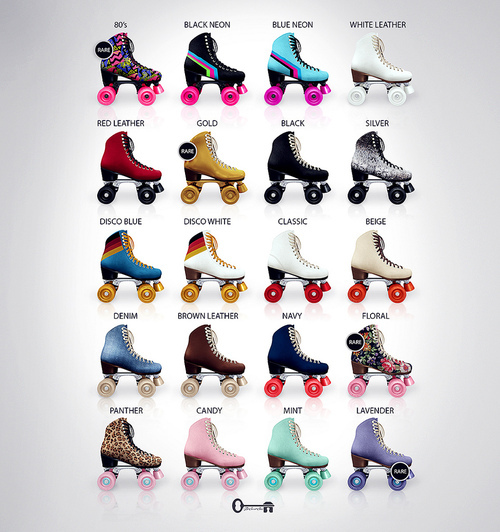 I’ve not been roller-skating in Second Life for a LONG time, but if I win the Panther skates I may be inclined to have another go! 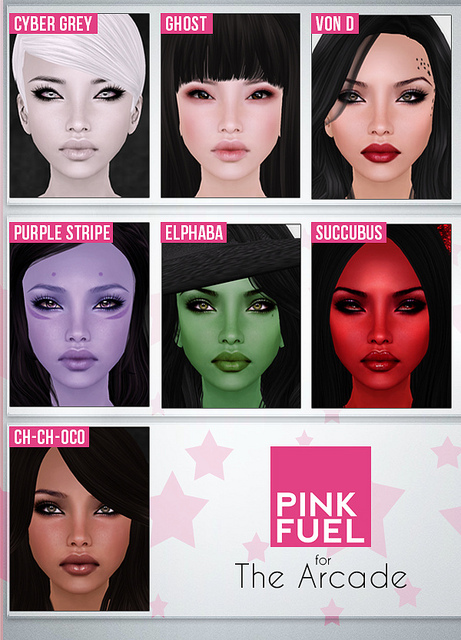 There are a number of skin Gachas to play at the event, and all of them look totally fabulous so I guess I’ll be having a punt in all of them, but the one I will definitely be hitting a smidgen harder than the others is from PINK FUEL. Why? Well because they have a skin called ‘Von D’ which looks right up my street. There are 7 skins available in the Gacha and all of them look very enticing and original. The Elphaba, Cyber Grey and Ch-Ch-Oco skins have really caught my eye too; in fact I’d be happy winning any of them. L$100 for a quality skin? Yes please! I haven’t told you about every single Gacha machine at this event because at the time of writing MORE images keep being added to the site, and to be honest I’m squealing so much in real life I’m about to give myself heart-failure. I’ve not told you about the gorgeous dress from BAIASTICE, nor the amazing mesh lamps from TROMPE LOEIL or the bedroom furniture from SCARLET APPLE, or the hair from TRUTH. OMG, some of the brightest and best that the grid has to offer are all here, and then some! There’s an official vendor list here. If I was to try to write about everything that would mean I’d be here all night working myself up into a frenzy and I’m excited enough as it is. I have a sneaky feeling that it’s also going to be an utter swine to get into as well, so it may be one of those rare occasions in-world where it may be kind to the sim and to the rest of us if you consider de-primming and using a low-arc avatar for your visit. Of course, with these being Gacha items you can transfer them, so that means if you get duplicate items you can swap them. The fun is in seeing what you get after all, but if you’re not lucky you’re your winnings why not ask around on Plurk or in ‘The Arcade’ group to see if anyone has any swapsies? But don’t forget you can also gift your winnings to friends, and that for me is key. In-world events like this are all about having fun and sharing the love with those nearest and dearest, and I can think of one chum in particular who may find herself receiving the odd item from me, especially if it’s too pink for my liking! Enjoy the event guys, hope you get all the goodies you wish for! Oh, and a quick note- be sure to check out the official Arcade blog. There’s an amazing photo competition with an astonishing array of prizes up for grabs that you must enter! Kitty Clean or Kitty Dirty?